Fly Fishing Opera? Bonefish Music. Have you actually ever been to the opera? I have. And for those of you who haven’t, I’ll sum it up like this: It’s an emotional (and sometimes physical) endurance test. For starters, you’re almost always uncomfortable. (I don’t know how you normally feel “dressed to the nines” and squashed in a red velvet-lined folding seat in a theater, but for me, “three-and-a-half” on the attire scale, and kicking back in a naugahyde recliner is the top of my usual game). At the opera, you wait patiently, politely, for minutes, sometimes hours, squirming in your own skin, wondering to yourself “What in the hell am I doing here (and why did I pay money to be in this place)?” Yet just when you’ve approached your tolerance limit, you experience something so profoundly beautiful—something so beyond the norm of human existence—that you may literally be moved to tears. And when that special moment is over, the memories are so profoundly ingrained in your brain that you cannot wait to tap it again, at almost any cost. In other words, attending the opera is exactly like bonefishing. You wear these funky clothes, but you’re still hot. You sweat. You wade. You toil. Of course, you did so with the belief that it’s cool to expand your horizons and experience something different. You see fish, but get refused. Over, and over again. And you inevitably start thinking to yourself, “F” this… until a school of silver ghosts glistens over a sandy flat… you miraculously wish-drop a cast into the zone… and one of those shadows peels off, eats your fly, and in doing so, profoundly changes your world forever. I actually turned onto opera music on a whim, when I took an Italian cooking class many years ago (and I had an Italian girlfriend). I speak English moderately well. I can communicate in German, and sometimes, very poorly, in Spanish. I don’t understand a lick of Italian beyond a restaurant menu. But I’ve actually found that opera music is an essential ingredient in my kitchen to this day. 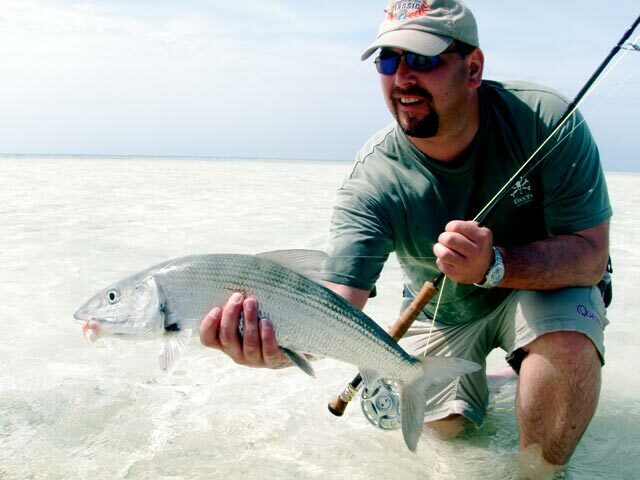 Interestingly, I once found myself wading on a bonefish flat in the Bahamas when opera music saved the day. It was slow. So slow, that I turned on the iPod, and set it to “shuffle.” I was hot. Tired. Ready to quit. And then I saw the fish. You probably know the rest: the fish swam right to the spot… I made the cast… the fish ate right at the critical moment of the song… I landed it and felt like I’d touched the face of God… felt like weeping… whatever. You must experience something similar for yourself to believe any of this. If you do, stick with Pavarotti. “Che Gelida Manina,” (from La Boheme); “Amor Ti Vieta” (from Fedora); “Vesti la Giubba” (from Pagliacci)… all good starters.